Yet if Mormon had already introduced himself somewhere in the book of Lehi, then why did he go out of his way to again reveal himself in 3 Nephi 5? One possible explanation is that Mormon’s narrative was reaching a crescendo of importance. He would soon record Jesus Christ’s visitation and ministry among his people, and to prepare the reader for this important revelation, he sought to further disclose and establish himself as a reliable witness. A careful analysis of Mormon’s statements suggests that both his discussion of records and his self-introduction in 3 Nephi 5 can be seen as part of the same narrative goal—to legitimize both the record and the record keepers of the Book of Mormon. For instance, Mormon felt it important to mention that his source record for the book of 3 Nephi was written by Nephi, the son of Nephi,5 and also that despite its brevity it was a “true account” (3 Nephi 5:9). His later comment that “we know our record to be true, for behold, it was a just man who did keep the record” (3 Nephi 8:1) further characterized Nephi as a reliable record keeper. If Bowen is correct, then Mormon likely emphasized his name and its history among the Nephites because it held connotations of pure and enduring love and because it linked him to the authority and covenant found in the “first church” established among his people “after their transgression” (3 Nephi 5:12). This juncture in the narrative of the Book of Mormon was ideal for Mormon’s interjection. The people had just completed a major upswing and reversal (commonly referred to as a pride cycle), which then resolved itself into a faithful period of righteousness (see 3 Nephi 5:1–3).9 Mormon’s self-revealing digression can be seen as a strategically situated message to prepare readers to accept the recorded events of Christ’s appearance to his people. In this light, Mormon wasn’t so much concerned about what people would think of him but with how they would treat the culminating sacred story that he was about to reveal. All readers would do well to carefully read Mormon’s personal testimony as a prelude to his account of Christ’s ministry in the land of Bountiful. Mormon wanted his readers to know that he was a real person, that he really wrote on records that he made with his own hands, and that he recorded things he saw with his own eyes. He was a true disciple and witness of Jesus Christ, and the sources from which he compiled his own record were likewise written by trustworthy witnesses. Matthew L. Bowen, “‘Most Desirable Above All Things’: Onomastic Play on Mary and Mormon in the Book of Mormon,” Interpreter: A Journal of Mormon Scripture 13 (2015): 27–61. Brant A. Gardner, Second Witness: Analytical and Contextual Commentary on the Book of Mormon, 6 vols. (Salt Lake City, UT: Greg Kofford Books, 2007), 3:70–84. 1. Mormon does introduce himself in Words of Mormon 1:1–2, but according to Brant A. Gardner, “Words of Mormon was likely written after [Mormon’s introduction] in 3 Nephi.” See Brant A. Gardner, Second Witness: Analytical and Contextual Commentary on the Book of Mormon, 6 vols. (Salt Lake City, UT: Greg Kofford Books, 2007), 3:72. 2. See 1 Nephi 1:1; Jacob 1:1; Enos 1:1. 3. See William J. Critchlow III, “Manuscript, Lost 116 Pages,” Encyclopedia of Mormonism, 4 vols., ed. Daniel H. Ludlow (New York, NY: Macmillian, 1992), 2:854–855. 4. Gardner, Second Witness, 3:71. Gardner further explained: “As the Words of Mormon show, when Mormon needed to make a textual transition, he attempted to smooth it out by providing linking and explanatory material. Mormon probably used a similar technique when he began his record in the initial 116 pages. Mormon could not assume that the reader would understand who he was and how he produced the text (especially when he made editorial comments without further self-identifications) unless he had previously introduced himself, describing his divine call to abridge the records and his purpose in so doing” (pg. 72). 5. See the introductory heading for 3 Nephi 1. 6. See Testimony of the Eight Witnesses (found in the introductory pages of the Book of Mormon); Richard Lloyd Anderson, Investigating the Book of Mormon Witnesses (Salt Lake City, UT: Deseret Book, 1981). The doctrine of witnesses is a crucial teaching found—both explicitly and thematically—throughout the Book of Mormon. For examples, see 1 Nephi 11:7; 2 Nephi 11:3; 2 Nephi 27:14; 2 Nephi 29:8; Jacob 4:13; Alma 10:12; 3 Nephi 11:16; Ether 5:4. See also Book of Mormon Central, “Who are the ‘Few” Who were Permitted to see the Plates? (2 Nephi 27:12–13),” KnoWhy 54 (March 15, 2016). 7. Matthew L. Bowen, “‘Most Desirable Above All Things’: Onomastic Play on Mary and Mormon in the Book of Mormon,” Interpreter: A Journal of Mormon Scripture 13 (2015): 60. See also “Mormon,” Book of Mormon Onomasticon, ed. Paul Y. Hoskisson, online at onoma.lib.byu.edu. Although some scholars have found it to be a less likely candidate, Jerry Grover has argued for an Egyptian etymology derived from mr. See Jerry Grover, Translation of the “Caractor” Document (Vineyard, UT: Grover Publications, 2015), 145. 8. Interestingly, Mormon’s closing statement actually mirrors the closing formalities of several epistles found in the Book of Mormon. Mormon wrote “And now I make an end of my saying …. I am Mormon, and a pure descendant of Lehi” (3 Nephi 5:19–20). For comparative examples, see Alma 54:14, 24; 58:41; 60:36. See also Robert F. Smith, “Epistolary Form in the Book of Mormon,” The FARMS Review 20, no. 2 (2010): 125–135; Sidney B. Sperry, “Types of Literature in the Book of Mormon: Epistles, Psalms, Lamentations,” Journal of Book of Mormon Studies 4, no. 1 (1995): 73–74; Book of Mormon Central, “Why was Giddianhi So Polite? (3 Nephi 3:2),” KnoWhy 190 (September 19, 2016). For a treatment of Mormon’s digression as a colophon, see John A. Tvedtnes, “Colophons in the Book of Mormon,” in Rediscovering the Book of Mormon: Insights You May Have Missed Before, ed. John L. Sorenson and Melvin J. Thorne (Provo, UT: FARMS, 1991), 36. 9. See John W. Welch and J. Gregory Welch, Charting the Book of Mormon: Visual Aids for Personal Study and Teaching (Provo, UT: FARMS, 1999), chart 144. Moreover, it seems that Mormon intentionally skimmed over several years so that he could insert his message at the conclusion of the 25th year since the sign of Christ’s birth (see 3 Nephi 5:7). It’s thus possible that he purposefully aligned the beginning of a new pride cycle with the commencement of a new hotun (five-year) cycle, a prophetic interval of time keeping in the ancient Mesoamerican calendrical system. 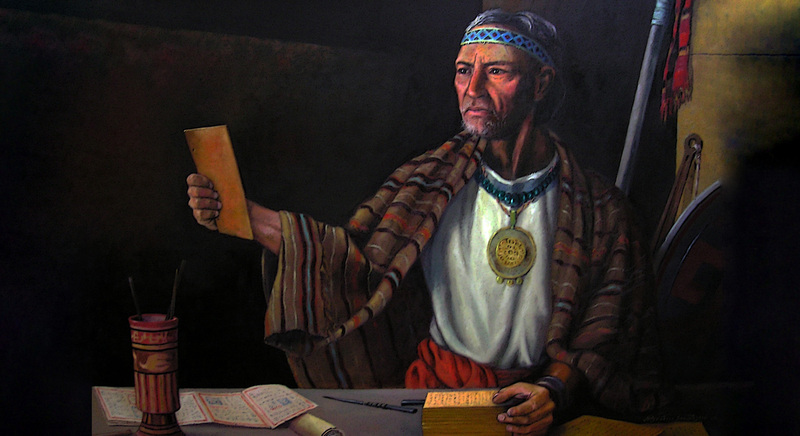 See Book of Mormon Central, “Why Did Samuel Make Such Chronologically Precise Prophecies? (Helaman 13:5),” KnoWhy 184 (September 13, 2016). Indicating his awareness of short-term cyclical patterns, Mormon soon reported, “thus six years had not passed away since the more part of the people had turned from their righteousness, like the dog to his vomit, or like the sow to her wallowing in the mire” (3 Nephi 7:8). See Book of Mormon Central, “How Did the Nephites Become Weak in Such a Short Time? (Helaman 4:25),” KnoWhy 175 (August 29, 2016); Book of Mormon Central, “Why Did the ‘Pride Cycle’ Destroy the Nephite Nation? (3 Nephi 6:10),” KnoWhy 195 (September 26, 2016). 10. M. Russell Ballard, “Beware of False Prophets and False Teachers,” Ensign, November 1999, online at lds.org. 11. See also the Introduction to the Book of Mormon.